This is a full-length novel set between Windburn and Rootbound. However, to avoid spoilers, the author highly recommends you listen to it after hearing Rootbound. 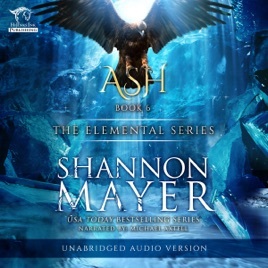 My name is Ash, and I am an elemental. As an ender, it is my place to protect the royal family at all costs. Despite being the best ender our world has ever beheld, I have failed time and again as the personal sacrifices continue to mount. Lark has been banished to the desert by her father, who is blind to the manipulation he has again fallen prey to. To bring about justice, I must seek out and destroy the one who intentionally wields her powers to bring pain to my people. Cassava’s death will finally free us from the dark cloud her reign of terror has surrounded us in. This is what I believe to be true, and I will seek her out with only one intended outcome. The reality, however, is much more complicated than my beliefs. When lies turn to truths, and enemies to allies, can I still find my way back to who I once was? Uncertainty makes me hesitant, but I can not give up. For justice. For Lark. No matter the sacrifice.